Docking, from the Old English meaning ‘place where docks, or water lilies grow’, is a large parish in the northwest of the county. A number of prehistoric flint implements have been found in the parish, including Mesolithic cores, scrapers and flakes (NHER 1633), Neolithic axeheads (NHER 1589, 1634, 13824, 20245, 30491 and 33911) and a barbed and tanged arrowhead (NHER 13208) from the Beaker period. The sites of two ring ditches (NHER 11902 and 35558), probably the remains of Bronze Age round barrows, are visible as cropmarks on aerial photographs. In the early 1940s the remains of a Bronze Age inhumation was found, but was destroyed before it was properly recorded. Several Bronze Age socketed axeheads made of copper alloy (NHER 1641, 1642, 12928, 24951 and 30126), and a Bronze Age palstave (NHER 16496), made of copper alloy, have also been found in the parish. A single fragment of Iron Age pottery (NHER 1644) has so far been found in the parish. The amount of Roman pottery, tile, and coins found by ploughing and metal detecting in the parish, to the northeast of the present village, suggests that there was a Roman settlement (NHER 13827) in this area. Roman ditches which were revealed by an archaeological evaluation in 2001, formed part of a Roman field system associated with the nearby settlement (NHER 13827). Roman pottery and tile (NHER 23305) have been found close to this area of possible settlement, and Roman coins (NHER 41772, 41771, 41770, 41767, 23303, 21606, 13208, 1646 and 1645) have been found scattered throughout the parish. A gold Roman ring, decorated with green glass, sapphire and garnet (NHER 41083) was found in the parish in the 1950s. Early Saxon pottery (NHER 34174), Middle Saxon pottery (NHER 36960) and a Middle Saxon brooch and pin (NHER 31215) and Late Saxon pottery (NHER 14439, 30502 and 33909) have all been found in the parish, close to the present village itself. In Domesday Book Docking is listed as a fairly small settlement, and the present village seems to have developed on the site of that settlement, which is on a crossroads leading to King’s Lynn, Fakenham and the coast. During the medieval period, Docking extended to the south of the present village, and the tofts, hollow ways and roads (NHER 15003) of the medieval village survive as earthworks in the landscape park (NHER 30502) surrounding Docking Hall (NHER 1656). St Mary’s Church (NHER 1657) dates mainly to the 14th and 15th centuries, and contains an elaborate 14th or 15th century octagonal font. The church was restored by Ewan Christian in the 19th century. The deserted medieval village of Southmere or Summerfield (NHER 1592) is to the northwest of Docking. 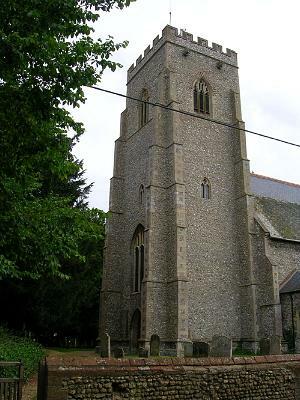 In 1086, it was a larger and more valuable settlement than Docking, but by the 16th century All Saints’ Church (NHER 1592) was in ruins, and the village was severely depopulated. Docking Hall (NHER 1656) is an early 17th century house, partially rebuilt by Ewan Christian in the 19th century. The Hall is surrounded by a landscape park (NHER 30502), created in the 18th century, with an avenue focused on a temple (NHER 15013), an ornamental viewing mound (NHER 1643), as well as formal gardens closer to the Hall. The Hare public house (NHER 15011) is a 17th century building, substantially altered in the 19th century, and the village stocks (NHER 15011) used to stand in front of the building. As well as the village stocks, the inhabitants of Docking could be threatened with the lock up (NHER 15012), an early 19th century building, which retains its original door and locking bar. Manor Farm House (NHER 20956) is a 17th century house, with 19th century farm buildings, one of which contains gun loopholes from World War Two. Docking was known as ‘Dry Docking’ due to the lack of a stream or spring in the village, and in the late 18th century the town well (NHER 1655) was dug to provide water for the inhabitants of the village. Early 20th century photographs show a wooden hut over the well (NHER 1655). In 1836 the Docking Union workhouse (NHER 15008) was constructed in the village, designed by the architect John Browne. 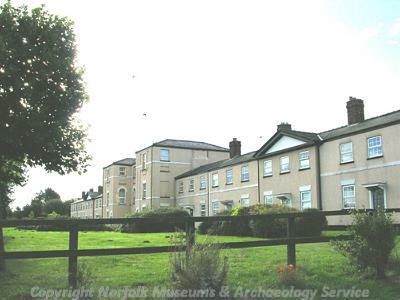 During World War One the workhouse was used as the officers’ mess for Sedgefield airfield (NHER 13162), and has now been converted into houses. Three World War Two crash sites are known from the parish; a Hampden bomber (NHER 13682), a Stirling bomber (NHER 13683), and a Hudson bomber (NHER 13684). 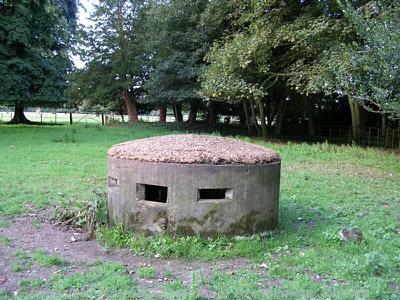 Two rare circular pillboxes (NHER 30778, 30779) have survived in the parish, as well as other pillboxes (NHER 30780, 30782 and 30783) and a spigot mortar emplacement (NHER 30781). During the Cold War a Royal Observer Corps orlit post (NHER 35400) was in operation until 1968. Sarah Spooner (NLA), 7 November 2005.